The paper listed below from the University of Minnesota Extension shows a really simple way to to use solar air heating collectors to heat the soil below a high tunnel greenhouse. While a fair amount of excavation is involved, the system is really simple and cheap if you have access to a backhoe. The results in terms of heating both the soil and the air were impressive. I think there are some potential shop, barn, and home heating applications for this idea -- see below. In a nutshell, the heated air from the solar air heating collectors is run through the soil under the greenhouse using the commonly available corrugated plastic tubes. The only other components would be a blower and a thermal snap switch. Really simple. The that carry heat from the solar air heating collectors to the soil being placed. They are yet to be covered by the GH soil. This has me wondering if the same sort of scheme might be used to help heat a shop or barn or even a house. 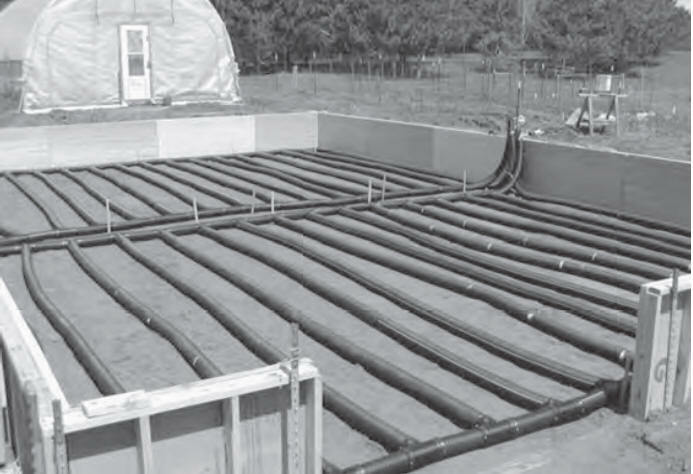 Sand beds as a means to store heat for solar heated homes is gathering a following, and this would be a really simple way to implement sand bed heat storage for space heating. Simple but good solar air heating collectors can be built for less than $4 per square foot. This is one example of a solar air heating collector using layers of black window screen that is inexpensive and fast to build and actually tested better than more expensive designs. It could be built it much lager units and could also be integrated into the building wall or roof. For something under $2000 (I think) a pretty effective solar home heating system could be built.